Beginner’s Guide to Free-Motion Quilting :: Review & Giveaway! I’m so excited to be the next stop on Natalia’s book tour! 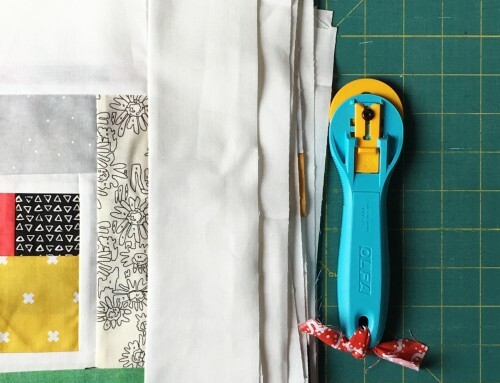 In the Beginner’s Guide to Free-Motion Quilting Natalia is giving all of us the knowledge and tools to work her beautiful quilting patterns into our quilts at home! Natalia has added a theme to the tour : It’s a Family Affair, I know for me anytime I’m sewing, I’m always surrounded by my family! My kids love fabric, and have been asking to make another quilt recently. My mom taught me to sew garments as a girl, along with the 4-H ladies, and since teaching myself to quilt, I’ve been teaching my mom the in’s and out’s of quilting! Quilting is definitely a family affair here – we’ve come full circle! Beginner’s Guide to Free-Motion Quilting is a perfectly organized reference. The first section Focus on Quilting, walks you through machine set up, techniques, and all the beautiful quilting patterns. Since Natalia love to design and piece quilts too – she designed six projects to practice and show off beautiful quilting too! 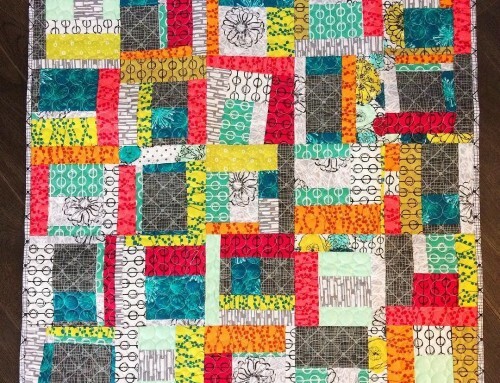 Those patterns are in the second section, and section three is chalk full of Quilting Patterns – a great space to trace and practice the movements before moving to your quilt top. I’ve had the privilege of seeing the quilts in the book; Round and Round immediately caught my eye as a project that would look great in any size! I decided to pull a few fun prints to piece with the gray background, and eventually decided to sash the blocks with an orange print. I had a lot of fun piecing, and quilting this little project! Now I just need to decide how to finish it – pillow cover or table topper? 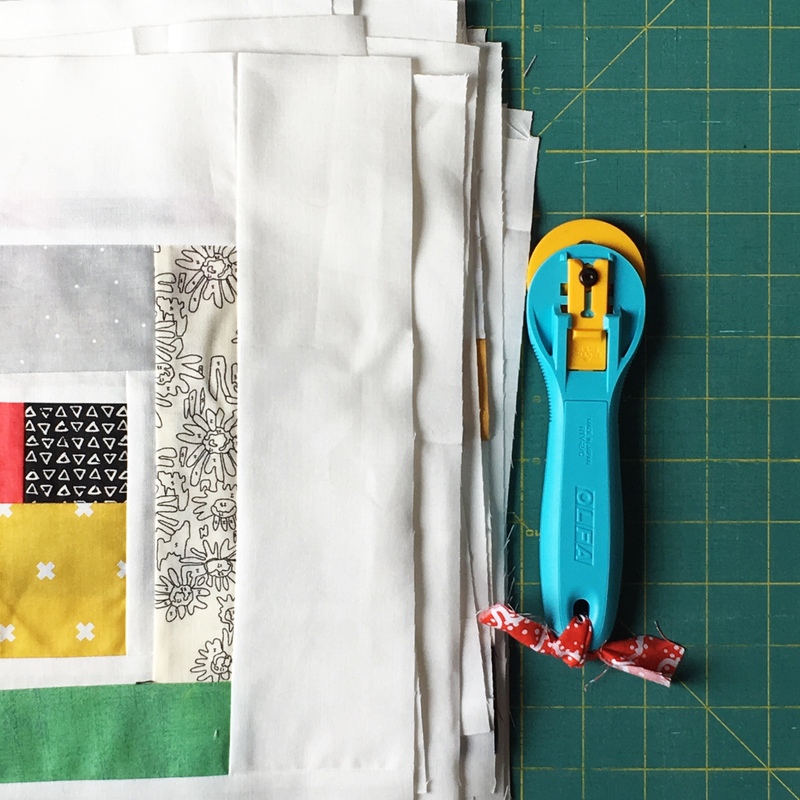 Beginner’s Guide to Free-Motion Quilting is a great addition to any quilter’s library, and sure to be a source of inspiration for many projects! 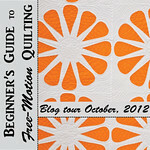 To win a copy of Beginner’s Guide to Free-Motion Quilting leave me a comment, telling me how you would finish my project. I will select a winner on October 19th, 2012 – Good Luck! I’d probably go with pillow cover! I would go for a table topper! I like the pillow idea. Very inspiring! I personally love the idea of a pillow topper! It looks beautiful! i think it would make an eye-catching pillow cover. I’m thinking table topper would be great! Your colors are wonderful – love the sashing. I think it should definitely be a pillow cover! Love the circles and the lines together! I would go for the table topper… but I would get my mum to sew it for me as she’s the quilter :). I would make it a pillow cover. I love the color choices. I would make it a pillow cover. :) It turned out so cute. I’d go for a wall hanging! It’s really beautiful! It’s very pretty – I like table toppers. Thanks for the giveaway! I think this would be better as a table topper than as a pillow cover. Set on a diagonal, the grid gives a lovely place to put table decorative accessories such as candles or a center piece. How about folding it in half, adding handles, and you have a lovely quilted tote? I’m not big on table toppers, generally, and am of the opinion that you can never have too many pillows — especially if they look like that! It’s a beautiful block! I would make a table topper…or a doll quilt! I would finish it as a pillow — it looks great ! Wall hanging because it looks like a window pane. Between the two I’d pick a pillow cover because I like pillows better than table toppers :)… But given all choices I’d pick a wall hanging, because I think it’s so beautiful! I would make a pillow. It’s beautiful. Thank you for the generous giveaway. I think it would make a fab pillow cover. Thanks for the chance to win! I would definitely do a pillow cover! I’m with the table topper folks. I could definitely use something like this on my end tables in my living room (and as a matter of fact, have been telling my husband I’d make something like that for months now). I would go with a table topper, but I would put the little corners on the back so I could hang as a wall hanging, too! It’s so beautiful…..I’d want out to view all the time! Table topper or pillow would work for me. I think this would make a great pillow. I would definitely make this into a pillow – something that says ‘Here I am, sitting up, take notice of me’. It is just too nice to lay flat. A pillow – seen from near and far. A pillow cover is my choice! Love the sashing! love how teaching goes full circle. hmmm, personally i would finish this as a table topper. Definitely a pillow cover! It would brighten up any couch. I am trying to decide between a pillow cover, wall hanging or candle/vase mat. Your beautiful quilt would make a great tabletop! A pillow cover definitely . . . very beautiful. Thanks for the chance. Pillow cover would be my choice for this very cool little quilt! A table topper for sure! I have started doing this lately as I have way too many quilts and this way I can see new stuff and change them out frequently. Thank you for the chance to win. BOTH…you may have to make another!! :o) This book looks great…and I like everyone else, would love to win it!! Thanks so much for the chance!! I’d definitely choose to make it a pillow cover. Thanks for the sweet giveaway! I would make it into a table topper. It is very cute! I think you should add a border and complete the circles that go up to the edge of the square, then finish it off as a table topper. I’d go with pillow cover! LOVE it! Pillow cover all the way! Thanks for the chance to win! I vote for a pillow. The asymmetry of the design is nice. Very pretty! I’d probably turn it into a cushion cover. I would go for a pillow cover! Thanks for the review of the book and the giveaway. My first thought was a table topper, but the more I looked at it, the more I could visualize this as a pillow! Either will be lovely. I’d love to win this book, it’s very timely as I am about to start a machine quilted project. Thanks! HI! I’D USE IT AS A TABLE TOPPER AND EITHER LEAVE IT BORDERLESS OR USE THE SASHING FABRIC AS A NARROW BORDER. It’s very cute either way. A pillow cover would really show off the whole thing. A table topper might get covered up with a lamp or flower pot or basket. So I’d go with the pillow cover. I would add a border & go with a table topper…I think horizontal surfaces just love table toppers!! I would finish it as a wall hanging. I have white walls and I just love the pop of colors I get from wall hangings and how easy it makes it to change the decor. I didn’t choose either because with 3 dogs, pillows tend to become the girls private property that I have trouble getting back, the same would probably happen to table runners too. Ginger, the youngest (2) tends to want anything I make. Thank you for the giveaway. I think I would finish it as a table topper. At my house pillows are thrown on the floor. I would hate to see all my work end up on the floor. I would finish it as a wall hanging! Love the mini quilt colors! I would make a pillow with it. I’d go with the cushion cover. If it’s laying flat on a table, you have to be right next to it to see it, but you can set the cushion so you can enjoy looking at it from further away. Table topper I think or pillow. Very pretty! Mini quilt and/or table topper. What brilliant work! It’s a perfect pillow cover Amy! I would do a pillow cover. The colors are so beautiful. I would bind it with the fuschia dot! Thanks for the giveaway! I would got with table topper! Would look BEAUTIFUL with a bouquet of orange and pink flowers on it!!! It would be a table topper at my house because with the kids, pillows just do not stay on the furniture. I think it would be a beautiful piece to frame. So cute! I think it would be a perfect pillow. But you know that then you would need to make a bigger version for a quilt to coordinate with the pillow. That would be cool! How about putting a binding on just as it is and then creating two sets of little bean bags: green and purple. It would make a fun tick-tack-toe game board set. That would sure make a wonderful pillow cover. I so badly want to learn to machine quilt, I’m so thankful for people who write such helpful books. I would do a pillow with it. I’d go for a table topper or a wallhanging! What a fun design! I love the bright colors you used. I think it would be great as either a pillow cover or a table topper! If the only choice is tabletop or pillow, i would choose pillow. Actually, it’s not one of your choices but I would frame it and use it as a picture. It’d make a great pillow cover. I would totally go with a pillow! It would look great as a statement on a couch or chair. I love it! I love pillows, so that’s what I say! My girls would probably steal it, though. They love geometric designs. Your project would make a great and fun pillow or wall hanging. Thank you for the giveaway. I love how the design would make for a very fun game of tic-tac-toe, which we love to play while sitting at the table, so I’m opting for the table top. We have a wooden toy box which could be covered nicely with this quilt and I’d probably make up some beanbags to play our game, too. You should finish it as a pillow cover. Close to you when you relax. Lovely design, it would look really nice as a journal. It would make a beautiful pillow I think. But also great as a wall hanging. It is such a lovely design, I think I would go for a pillow. Thanks for the giveaway. I would make a wallhanging. I would start with a narrow border, same width as the border between the blocks. Then I would make an outer border of that aqua background, and applique circles (maybe quartered) with the circle fabrics. Hope you choose mine, I would love to see it outside my head! I would do a table topper! I have not done any fancy quilting and would love to learn how. I would definitely go with the pillow! Thank you for the opportunity to win this lovely book. Your quilt is so much fun!! I would go with a table topper. Thanks for the give away. My vote is for a tabletopper. Great work! I think it would make a fabulous pillow cover! I vote for pillow cover….and I would pull that gorgeous dark polka dot fabric to be the flip side! Thanks for the chance to win….my FMQ skills are rudimentary! I vote for pillow cover. A table cover would probably result in something being placed on top of it and covering it up. I want to see that beauty! Oh I see a cute little mini quilt or wall hanging! I love that. Isn’t it funny when you can see something and think….bingo! Why didn’t I think of that! I love it! I think it would make a great pillow. thanks for a chance to win the book. I always vot for pillows, on the table things spill. I would be so sad if something that lovely were ruined! May I suggest a third option? Wall-hanging! It reminds me of window panes and I think it would look great on a wall. Table topper I think. Would love to be entered in the giveaway! It looks like a great book! I’d make a pillow cover. Pillow cover ..it would be adorable. I think with some solid orange and linen fabric a pillow in that design would be really striking. Oh!! I’d make a Table Topper!!! Cute!! I would stitch it up with all white around each block! Definitely cushion cover. And maybe make a few more of them, give them away as a matched set! I can see your piece hung in a picture frame (no glass) and hung on point. That would be a great way to show it off. Definitely a pillow! It’s gorgeous!!!!!! I think it would make a nice pillow. It’s so pretty that I’d probably want to look at it all the time, so I think a wall hanging would be a great way to finish it. I think it would make a gorgeous pillow cover. I would normally go with pillow cover, but I like this for a table topper. Very pretty! Definitely Pillow … it’s to cute to put on a table – things on tables always get buried under other junk! I pillow always is in sight and it would brighten up any room! I’d would try making half circles from the dark and light fabrics and border the square with them. It wouldn’t be exactly a scallop border but would nice, I think. I think wallhanging would be wonderful! What a perfect way to showcase your project!! It already looks like a pillow cover to me, so definitely that! I’d finish it as a pillow! THanks for the chance. Pillow for sure!! 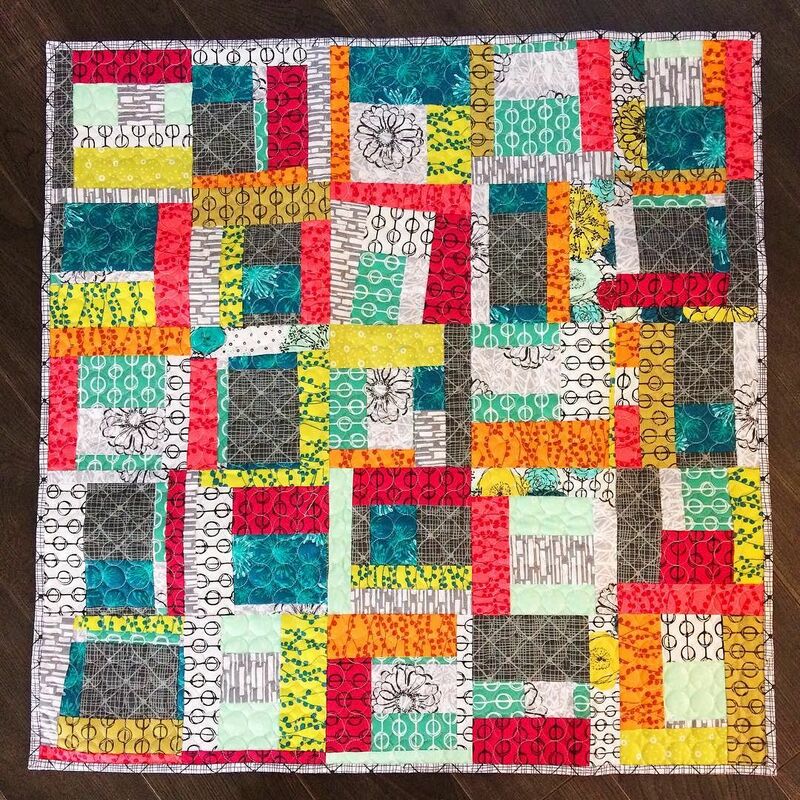 Loved the quilting and fabric choice you used on this project. I would love to win this book! I just finished making Graduation from your book Modern Basics. I ordered the exact colors you listed in the pattern and very happy with how it turned out. I quilted it myself with straight lines. I just have to sew on the binding to the back. I am giving it to my daughter for Christmas. I would definitely finish it as a table cover–great colors, great pattern and wonderful quilting. Good Job! Love both ideas but might have to go with the pillow…so pretty! 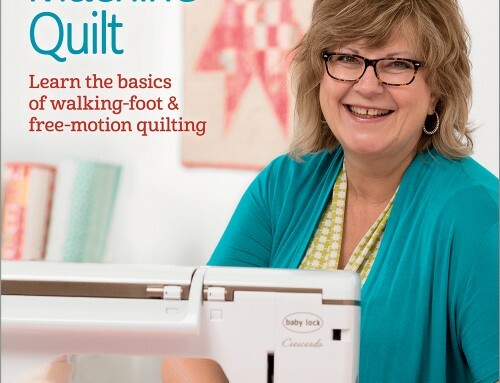 I would love to learn free motion quilting and the book looks like it would be a perfect way to start. Thanks for the giveaway! I think a wall hanging would be fun to show it off! I think it would make a cool looking pillow! Table Topper for me — It’s just beautiful! I think it would make a pretty wall hanging. The sashing reminds me of window panes. I love the colors you chose. I think it would look great as a pillow. I think a Pillow would be great! Thanks for the chance to win! Finish with a wide flange border and make it into a pillow. I would love the book. I have 2 quilts waiting to be quilted. 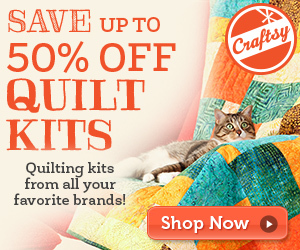 I’m always hesitant to do the quilting and would love more resources to boost my confidence. I vote for pillow cover. It sounds like a wonderful book – useful to see some different ways of free motion quilting. I would make it into a table topper as I like center pieces for my tables. Thanks for participating in the blog hop and for the chance to win this nice book. What a colorful project! I vote finish it as a table topper to use once the holidays are over and you want something bright and cheerful! I would go for the pillow cover.. It would look great on a neutral colored couch in the fall. It should be a pillow so you could snuggle up with it and trace that circular quilting around, and around, and around, and around. Wanted to mention, too, that I love your header! Pillow topper! I have pillows on my brain because my husband asked me to make some pillows to go on the sofa! I like the table topper. But either would look great. I’d love to make a tablecloth with this beautiful design, the colors are beautiful! I want to win this book, thanks for sharing. It’s screaming pillow cover to me :) Whatever you decide, it is beautiful! I would go with the pillow. It’s very pretty. I would make it a wall hanging. Those colors would brighten up the whole room! I’d probably make it into a sewing machine cover. My poor baby really needs one. I’d dust more but that would cut into valuable quilting time! I would make it into a darling pillow cover. Thanks for the chance to win. and Thanks for the blog. I think this would make a very cool pillow cover. Pretty colors! Pillow cover! Love the colors you chose (and the circles, I am a sucker for circles). I would make a pillow cover. It would be a cute pillow. My vote is pillow cover; lovely; thanks for chance! This would look good either way. I’m leaning toward pillow. I would hang it on a wall – on point! I think that block wants to be a soft squishy pillow! A wall hanging I think?! I would do a pillow cover… but with how beautiful it is, I’d almost be inclined to do a wall hanging with it for my sewing room! Thanks for hosting the hop and thank you for the opportunity to win! I say a pillow cover and I would add the trim that has the little pom poms that dangle.. OH SO CUTE! I would say Pillow cover, it is super cute! Thanks for the chance. I’d have to vote pillow cover. Thanks for the chance to win. I’d make it a pillow! I would love to see this block as part of a tote or bag. A pillow topper or table runner would be wonderful but that is beautiful enough to frame and display as art. You have a lot of feedback and it is fun to read all the ideas. Thanks for a great review and the opportunity to win a copy of this fabulous book. I’d go with pillow cover. 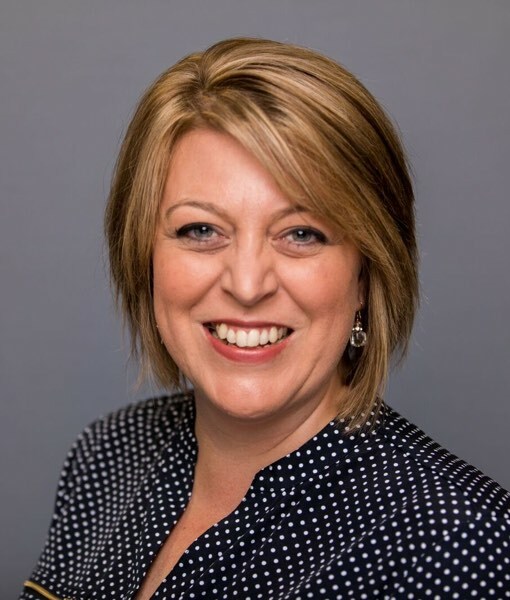 Hi Amy, Props to you for yet another great review of Natalia’s book! Your block is beautiful and the colors just flow together. It would make a great pillow topper but its got so much character in it that I’d have to say a wallhanging! It’s just one of those blocks that demands attention and conversation! It’s so pretty I’d go for a small lap quilt to go over the back of a sofa. I think it would make a fun pillow cover. Love it! This screams pillow to me. I’d go with the pillow cover. Love this book and would love to have it! Also, love your project and I can see it as a pillow top. Great color choices. Thanks for giving a book away. I’d go with a pillow top. Table topper gets my vote! I have to go with the majority and say pillow cover but it would make a great bag too. Between the two, I’ll choose table topper. However, if you would like to consider another option, I think a tote bag would be very pretty too. Since I hope to start FMQ soon myself, I really need this book. 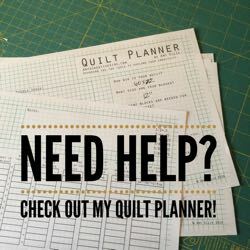 A newbie at FMQ needs all the help she can get, right? It would be super cute pillow! How about a wall hanging? Bind it in that neat purple-y fabric, then hang it up! It would make a fantastic anything, but I vote pillow! My first choice would be a wallhanging. But if you want a pillow or table topper, I would choose pillow. Really nice work! This finished as a pillow would make any room POP! Very pretty! I’d go with a pillow cover! Pillow cover. It is amazing ! I picture your little quilted piece as a pillow cover for a teen’s room or in the family room. It turned out great! Juro que colocaria na minha porta quarto de costura como uma linda guirlanda de boas vindas. Table-topper, as then it could double as a wall quilt in another life!! I would do both! Complete the back like a pillow, bind it, and you can either stuff it with a pillow form or leave it to use as a topper! I would like it as a pillow cover or perhaps a wall hanging! I think your project would look great as a pillow. So cute. I think a pillow cover. It would give a very modern look to a room. How about a cute bag sew that you can carry it everywhere and more people would get to love it ! I think your piece would look great as a pillow cover. I think it would make a beautiful pillow top. My first thought was – wall hanging! But, between table topper and pillow…I think table topper. I would make it into a pillow cover so I could enjoy the whole little quilt. The stitching is wonderful too.